When this book first arrived back in 2015 and I saw the word suicide on the back cover this book went straight to the bottom of my To-Be-Read stacks. Now I realize the second book in this series is waiting on my Kindle, The Murder of a Queen Bee and the third book, A Hive of Homicides , comes out September 26. So I decided to say a little prayer, put a little armor around my heart, and start reading. I almost stopped immediately because the way the victim died was so similar to how my son took his life but I could swear I hear Kris saying “You got this, Mom.” I am glad I kept reading. Ex-cop Abigail Mackenzie has started a second career–as a farmer. Raising chickens, keeping bees, and growing heirloom vegetables on her farmette in the Bay Area, Abby has a peaceful life. Yet trouble just seems to make a beeline for her. . . When Abby attempts to deliver her artisanal honey to local pastry chef Jean-Louis Bonheur and finds him dead in his shop, her investigative instincts kick in. After the chef’s handsome brother insists on hiring Abby to find out who killed Jean-Louis, she must sort through a swarm of suspects. But as she closes in on the truth, she’ll need more than her beekeeper suit to protect her from a killer’s sting. . .
Abigail Mackenzie has left the police force for life on a farm. Her new life includes chickens, bees and growing veggies and fruits. She also does a little investigating on her own to help pay the bills. While delivering a new batch of honey to a local restaurant she finds chef Jean-Louis Bonheur dead in his kitchen. The police quickly rule his death as a suicide and close the case. 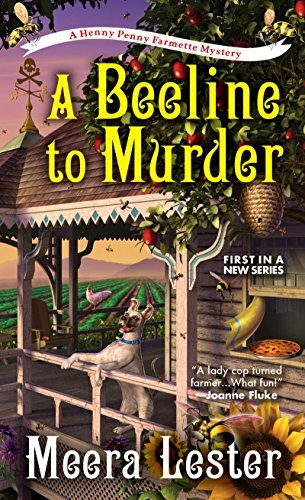 When the chef’s brother comes to town he finds the ruling unacceptable and get a bee in his bonnet to hire Abby to investigate. She would just as soon make a beeline in the other direction but she has a hard time bee-lieving the chef would take his own life too. Together they try to find out if he was really murdered but they could both get stung before they get all the answers they need. I liked Abigail Mackenzie from the very first page. She left the police force due to an injury but she still helps out when she can. Shocked to find a man she knows dead her training kicks right in. She checks the body and the scene and gives a thorough report when the officers reach the scene and she continues to theorize what may have happened. She even jumps in to help the medical examiner’s assistant, new and on his first call, get the body on the gurney and in the body bag. All the while searching for more clues. She is respected in the community and that helps as she takes on the investigation herself. She is patient and wise and sees things other people miss. She is my kind of amateur sleuth. Ms. Lester’s writes with a very even flow. She introduces us to all the characters and their relationships. Some are more fluid and some are just developing. I found all of the characters very interesting and want to get to know them even better in future stories. Her pacing is perfect. The mystery has a few red herrings to divert us from detecting the true killer. I was kept guessing right to the end. I also enjoyed the recipes and tips following each chapter. This is a fine start for this series. I am looking forward to the next installment. The link to the entry form is missing. The link for click here for entry form does not seem to be working on your e-mail or your web site. I got here by clicking see all comments. This one sounds like a winner. Have requested this one and the 2nd in the series from my library. Thank you.